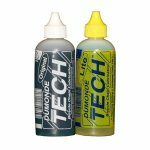 Use with a Braze-On type Front Derailleur usually requires the FIT LINK also. These are the chainrings of The Junior Solution — WickWerks answer to Junior Road Gearing Requirements. Read the article to understand the many benefits for Junior road racers participating in sanctioned races. 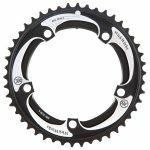 These chainrings and the associated FIT LINK solve most junior gearing restriction requirements for road bikes. This is the revolution in meeting Junior Gearing needs. 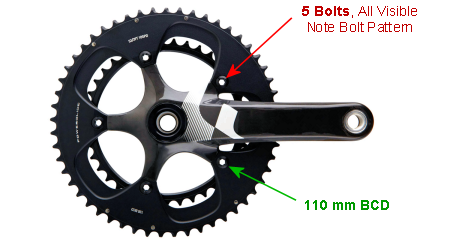 – 110mm BCD, 4 or 5-Bolt versions for the various crank types. Note: Check actual roll-out measurement on the bike to be sure. Don’t rely only on calculations. Note: Some governing bodies have different roll-out rules. Check your applicable rules. 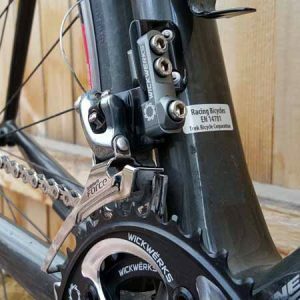 – Most Road Bikes with braze-on mounted front derailleur will require the FIT LINK adapter for proper positioning. – May not work with all bikes. Read “The Juniors Solution” for product limitations. Roll-out is defined as the distance a bike travels in one full pedal revolution when in its highest gear. This is usually measured by pushing the bike backward (so the pedals turn with the wheel). In the USA (and many countries), the roll-out distance is 26′-0″ (7.93 m). Note: Check your local rules. There are numerous ratios that will accomplish this, but there are definitely limits to finding the right ratios with available hardware. Another source for info is Life on The Bike. 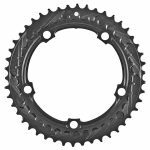 For a bicycle equipped with typical 700C x 25 tires and a 11t small cog on the cassette, our 41/33T chainring set provides a 3.667 ratio; and an estimated roll-out distance of 25.67 ft — just shy of the 26 ft limit. (Calculated) Note: calculations are good, but distance rolled out is the governing standard. Tire size and other factors contribute to the actual roll-out distance. As mentioned, there are lots of ratios that meet roll-out limits, but the constraint is usually finding the equipment. Tire size can be one of many. The 700C x 23 is popular, but 700C x 25 and other sizes are available and nice for certain situations. Cassettes are available with various tooth counts, but the 11-(?) are most common — like 11-25 or 11-27 or 11-28. 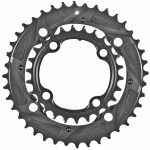 Paired with our 41 tooth big ring, the 11 tooth small cassette cog is a great ratio (making a 41 to 11 top combination) and will be legal for most bicycle arrangements. Often, rings sized for Juniors don’t shift well. That is troublesome for kids in racing situations. It is also troublesome because they don’t learn the valuable advantages of knowing how and when to make that front shift — because they become afraid it won’t work — so they just stay mostly in one ring and “slog” through it. The Junior Solution is WickWerks answer. 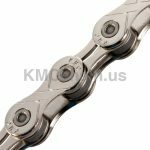 This is an integrated approach that include the chainrings, and, the “Fit Link” required to mount the front derailleur properly with the small chainrings on bike frames equipped with a braze-on mounting tab. At WickWerks we’ve integrated our BRIDGE Technology with all our rings — even these sized for Junior gearing limitations. These are the best, fastest shifting rings on the market — for kids and adults! Secondly, the WickWerks solution is lighter than most. 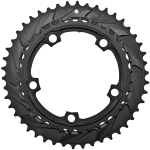 Compared to the most common combination (52 front – 14 rear), the 41t WickWerks front ring is much lighter. Also, high-end 11-25 or 11-28 cassettes are readily available and all are lighter than the (usually low-end, heavier) junior road cassettes. This combination using WickWerks Junior Road Gears with a high-end 11-(?) cassette will definitely save weight — approx. 300g in some cases — and help your junior accomplish their racing goals. Get the complete Junior’s Solution package here. For setup tips and ways to achieve optimal shift performance, visit the Mechanics Corner. The mechanics pages also include equipment compatibility suggestions with tricks & helps for troubleshooting. 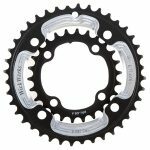 Though these pages are written for WickWerks chainrings, much of the information applies to all chainrings, and suggestions given are applicable to being a better overall cyclist, no matter what you ride. Warning: Riding WickWërks chainrings may cause elevated expectations of performance. Other chainrings may then seem inferior. Which Crank Type Do I Have? Examine the images below, then expand the accordion bars to read about crank details. 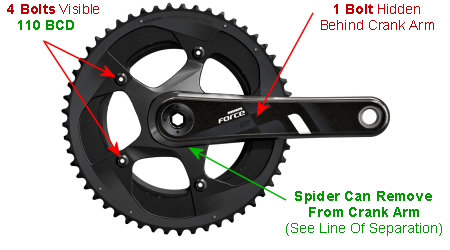 This will help you determine what crank you have, and which chainring option to purchase. Please Note: Paint schemes and decoration will vary by manufacturer, by product level and by year of production — all you need to do is identify the shape and bolting configuration. The word “Standard” is a bit of a misnomer when it comes to cranks. It’s called “Standard” because cranks of this configuration have been around a long time, and are still quite popular. To identify this style as “Your Crank”, compare the bolting configuration to the image; then, check the Bolt Circle Diameter. This unequal 4-Bolt design by Shimano is now their higher-end stape. 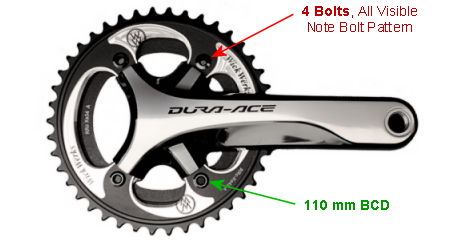 The Dura-Ace, FC-9000, is shown here, but they come in most of the product levels like Ultegra FC-6800, 105 FC-5800 and even the Tiagra FC-4700. All of these Shimano cranks are 110mm BCD so you don’t have to worry about which Bolt Circle Diameter. To identify this style as “Your Crank”, compare to the image and make sure the functional parts, like bolt locations, are the same. Names and decorations may be different. Exogram is the name this crank style was originally called. Mostly it’s just Red 22 now, but it’s different from other SRAM cranks, and it needs different hardware to mount rings on it. The thing that distinguishes this crank is the 5th bolt, hidden from view, that threads into the back of the crank arm. 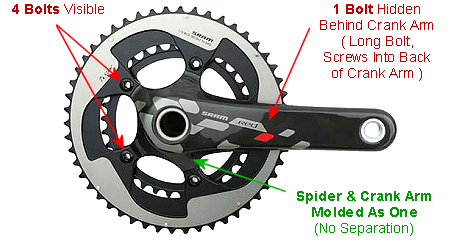 Other SRAM cranks have hidden bolts, but only this type has the bolt that threads into the crank arm. 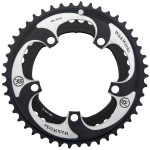 Made only by SRAM, this crank is available in both 130mm & 110mm BCD. These cranks, also with the 22 designation are similar to the Exogram, but different enough that they require different mounting hardware. The thing that distinguishes this crank is the 5th bolt, hidden from view, that DOES NOT thread into the crank arm. 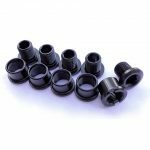 Though it may look permenent, the spider of these cranks can come off and be replaced — convenient when you want to mount a Quarq or direct mount single, or change BCD. Copyright © 2018 -- WickWërks LLC -- Exceptional Cycling Components for the Passionate Rider!